Free Crochet Pattern -- Give Thanks! Add a touch of elegance to your Thanksgiving table with this lacy filet set. 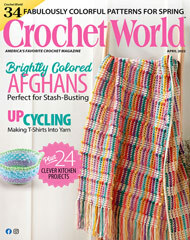 This e-pattern was originally published in Crochet World October 2008. Size: Place Mat: 17 3/4" x 12 1/4". Napkin Ring: 3" wide. Coaster: 3 1/2" x 3 1/2". Made with size 20 crochet cotton thread and size 9 (1.25mm) steel crochet hook.